Who’s the Best? This one question sparks the most fervent debate among sports fans. Was Willie Mays better than Mickey Mantle? How does Barry Bonds compare to Ken Griffey (or Babe Ruth, or Sammy Sosa, or whoever)? Is Joe Montana better than Dan Marino? Is it Wilt or Russell? A few weeks ago I responded to a Bill Simmons observation that Tim Duncan is clearly better than Kevin Garnett. My argument focused on the quality of teammates each got to play with and concluded that these two players, despite very different team outcomes, were actually quite similar. Today I want to focus on two great players who had very similar team outcomes: Magic Johnson and Michael Jordan. Magic and the LA Lakers went to the Finals nine times, winning five titles. And as noted previously, Magic was the most productive player on those teams. MJ took the Bulls to the Finals only six times, but his team won all six times. And as detailed yesterday, His Airness was the most productive player on those teams. But which of these two players was “better”? For our answer, let’s turn to The Wages of Wins metrics (were you expecting a different approach?). Here is Magic Johnson’s career performance in terms of Position Adjusted Win Score (PAWS), PAWSmin, Wins Produced, and Wins Produced per 48 minutes [WP48]. Magic played thirteen seasons and produced 316.5 wins, for an average of 24.3 wins per season. His career WP48 stood at 0.457. To put those numbers in perspective, Jason Kidd led the NBA in Wins Produced in 2006-07. Kidd’s final mark was 24.8 wins and a WP48 of 0.405. So Magic’s average season is better than anything we saw in 2006-07. Now let’s look at Michael Jordan. Jordan played 15 seasons before finally retiring at the age of 39 in 2003. Across all these years he produced 289.6 wins and posted a 0.339 WP48. Of course these numbers are brought down somewhat by what he did after both his first and second retirement. If we only consider MJ’s first nine seasons, before he went to give baseball a try in 1993, we see a much higher level of production. At the end of the 1992-93 season Jordan had produced 213.1 wins, for an average of 23.7 per season. If we ignore the 1985-86 campaign where he only played 18 games, his per season average rises to 26.4 wins. His WP48 before the first retirement was 0.396. In terms of Wins Produced, his average was better than anyone this past season, although his average WP48 was just a tad below what Kidd offered. Of course we are not comparing Michael to Kidd, but rather, Michael to Magic. When we consider both players in their prime we see that each was extremely productive. It does appear, though, that Magic was just a bit more productive. Magic’s average WP48 hovered around 0.450 while MJ is closer to 0.400. Both are amazing numbers. But Magic is a bit higher. Of course we want to know, why are we getting this result? Here are three possible explanations. 1. Wins Produced is based on box score statistics. This metric does include defense, but only at the team level. In other words, defense is incorporated for each player in terms of how well his team plays defense (a couple of months ago I experimented with using 82games.com data to improve on this approach, but the player evaluations seemed quite similar). Now if Jordan was a much better defender than the average Chicago Bulls player, then Wins Produced understates his contribution. Likewise, if Magic was a much worse defender than the average player on the Lakers, his contribution is over-stated. It’s important to note, MJ must be much better than the average player on Chicago, not the average player in the league. Although we have no data on how well these players played defense, it does seem to me that many of the Bulls players were pretty good defenders. So it seems unlikely that MJ was immensely better than his teammates, but it’s possible. 2. In calculating WP48 for Magic I used the relationship between PAWSmin and WP48 in every year except 1980-81, 1986-87, and 1995-96. 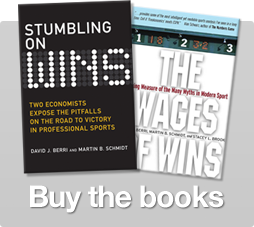 In those three seasons, I used the more extensive approach detailed in The Wages of Wins. This approach explicitly incorporates team defense and hence tempo, and is a bit more accurate measure. It’s possible that Magic’s numbers would be lower if I used the more extensive approach in every season, as I did for MJ in every year except for 1984-85 to 1987-88. 3. Maybe it’s not team defense or how WP48 is calculated. Maybe when all is said and done, Magic is just a bit more productive than Jordan. Whether you like Magic or Michael, we do see in the data that each player, in their prime, is better than any player playing today. The two best players over the last decade are Tim Duncan and Kevin Garnett, and neither of these players comes close to Magic or Michael. Of course that might be because the average player in the past ten years has improved, and hence the very best cannot move so far from the average anymore. Okay, that’s something that needs to be talked about another day. 9 Responses to "Magic and Michael"
That last comment is one that I am very intrigued about.. I was starting to write a statistical analysis about Michael Jordan while looking at the overall efficiency of the NBA throughout the last thirty years or so, and I was noticing a trend similar to what you stated. I really do think that due to the global market of the game in the 21st century, the talent pool is much richer. And thus, I believe just as you said, it is harder to be such a great superstar now than it was when Michael Jordan was playing. I love the blog, it is a daily part of my internet browsing. I’m curious if you have looked at strength of schedule type metrics to facilitate comparison between players? One way to get more insight would be to normalize WP relative to how tough the opponents were. One of the most interesting things about Magic is the concept of a point guard in a power forward’s body. Magic had 3 inches and 40 pounds on Jordan, yet I’m guessing you are using .128 as the position adjustment for Jordan and .132 for Magic, right? In one way, it seems almost unfair to categorize Magic as a point guard, since he was so big, could play every position on the court, and obviously had a much easier time getting rebounds than his 6’1″ contemporaries. And yet in another way, maybe it is fair, as it shows what a unique, once-in-a-lifetime talent Magic was. Either way, thanks for the interesting evaluation and insight. There is a very small chance that we’ll ever see anyone like either of these players again. And it makes it that much more special for those who got to watch the incredible fusion of talent and flair that was Magic, or the unbeatable competitive fury that was Jordan. It’s good to see that it’s not just our imagination, but the stats still hold up that no one playing the game today is as good as those two were. I completely agree with JChan’s second thought: that it shows what a unique talent Magic was. There’s nothing stopping huge players from playing the point except skills — if Shaq had great ballhandling skills, an outside shot, and passable perimeter defensive skills, he too could play the point and get that position adjustment. After all, Magic being a huge point guard helped the Lakers in lots of measurable ways — getting rebounds, steals, assists over smaller players, and post-ups against much smaller 1s and 2s. It’s no surprise that his WP48 reflects those advantages! I agree with JChan’s second thought and TK’s. Thank you for this incredible body of work. I’ll be buying the book and reading more for sure! Lastly, thanks for bringing to light through scientific measures, Magic Johnson’s superb play, that has often been overlooked, forgotten with the new ESPN myths and stories. Your comparison of the WINNING M & M “pair,” of course provides me yet another (an unrequested I am sure) opportunity to pose a “Position Pairing” princuples, as the WINS pattern design for the game of basketball. My earlier comments highlighted the dominance of guard/center WINS pairs among MBA chanpionship teams through the ages. I noted the glaring absence of a necessary center “position” to “pair” with Kobe as the design pattern destined to leave the team formerly known as lakers treading water. Hopeful signs of a KG trade (the ONLY center capable of “pairing” with the excellence level of Kobe) indicates that NBA front offices implicitly acknowledge that the “position pairing” of guard/center is essential to produce WINS. My earlier commentary also noted that the guard/center “position pairing” pattern can also be used to highlight truly exceptional NBA players who literally “change the game” by winning without the guard/center “position pair” design. Among those who my casual recollection places in that “players who changed the game” category are Jordan, Bird, and most recently King James. However, as I pondered the great “game changing” players, others emerged that managed team WINS without having the “position pair” of guard/center leading the WP48 rankings on their championship (or near championship teams). For example, Dr. J, George Gervin, Oscar Robinson, and even the Stockton & Malone duo (not guard/center … but a “true” guard and power forward pair — Duncan plays like a center). These players, produced team WINS with exceptional talent that defied a conventional guard/center “position pairing” design. The “position pairing” principle might also hold accountable high profile player duos who have not prduced championship caliber team WINS — as expected. The Nets Kidd & Carter combo, and the hopeful Iverson & Anthony coupling would require truly “game changing” talent to produce such WINS, because they are not aligned with the guard/center pattern design of basketball. Of course, such talent is wanting in those cases. So here is the WINS challenge DJ, what is the proportion of NBA championship teams who are aligned with the guard/center “position pairing” and affirm that unique pattern design for the game of basketball? [e.g., top team WP48 players would be guard and center pairs] And, which NBA championship teams highlight truly “game changing” players by winning without the guard/center “position pair” design pattern? My bet is that “position pairs” ARE the game’s pattern. However, my enjoyment comes from having forums and friends for sharing thoughts about WINS in all of our beloved games. Why not use blocks and steals per 48min as a proxy for the defensive capabilities of the players on each team?